Home Franchising Business Food Will This Business Become the Best Pizza Franchise in 2019? Looking into how to start a Pizza Business or Franchise? Meet NKD Pizza, all the way from New Orleans (USA). This Pizza Franchise business was founded in 2006, in a 500 sqm building that took in 6 feet of water during the notorious Hurricane Katrina. It was there where a few young entrepreneurs created a small “Pizza Lab”, and came up with new disrupting ideas in a very old billion dollar industry. What’s so revolutionary about the NKD Pizza Business Model? Back in New Orleans, the “Pizza Lab” entrepreneurs came up with a new disrupting Dough, composed from 10 grains and seeds bound together with pure water – instead of the old harmful dough stabilisers. The revolutionary recipe provides a high fiber and nutritious dough alternative to all the heavily processed pizza dough used by most pizza companies. NKD pizzas are also made by hand and baked for the exact right balance of crunchiness and chewiness. This unique Pizza Business inspiration didn’t stop there. They created a homemade tomato sauce with a special blend of herbs and spices, free of citric acid or added sugar and gluten free. Again, healthy. They also claim to use vegan toppings, Halal meats and the highest quality and freshest ingredients available. These guys have a bold mission: Fight the epidemic of declining health, by making a healthier Pizza for all the Pizza addicts out there. The NKD Pizza Business idea of focusing on “healthier” fast food is hitting precisely in the current global trends. In a recent poll by Forbes, 88% of respondents said they would pay more for a healthier products. On top of focusing on selling a healthier Pizza, NKD chose to build their store model as a carryout and delivery pizza business. Why? Because it facilitated the ROI (Return on investment) necessary to build the infrastructure that allows them to scale and achieve more impact, according to the founders. The NKD Pizza Delivery business uses high-end technology to ensure a delivery time of around 30 minutes, “a time that customers are not only happy to receive their food but they know it’s fresh”, according to NKD. Bottomline, with a special dough recipe that is tried and tested, and already bolstered with international Pizza Franchise locations in the UK, Ireland, UAE, Bahrain and Bulgaria – NKD is disrupting a $139 billion global industry. NKD are constantly establishing Master franchisors in new markets, as consumers everywhere keep looking for a healthier type of pizza delivery company. They have an established board of internationally recognised franchise leaders with a strong vision to grow effectively. They want to become the best delivery company in the industry, mainly through focusing on food quality (a healthier pizza), speed of service, and ensuring that franchisee success is at the forefront of its vision. 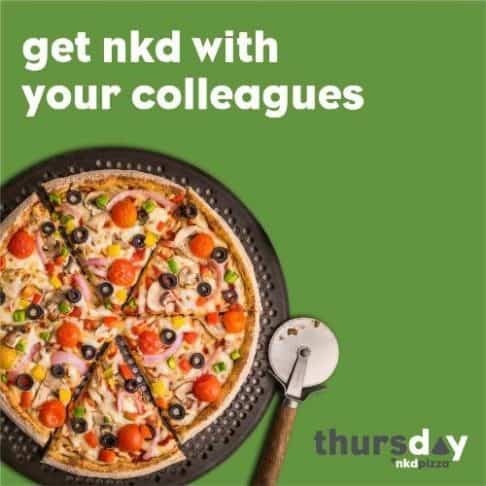 Why Franchise With NKD Pizza? Their unique 10 grain ancestral dough = Healthier Pizza. Quality focused supply chain, sourcing the highest quality ingredients available = Healthier Pizza. Comprehensive three-week training programme for Franchisees. Support at every stage, from site selection to operations. Possibility to be a Multi-Unit operator. NKD pizza are searching for highly driven entrepreneurs who are looking to grow a quick service Pizza business by opening a minimum of 10 branches over the next 3 years. How Much do you need to Start a a NKD Pizza Business? Total average cost per unit of PHP 12M – (Including all start up costs) – typically 1,500 sq ft.
How Big Should the Pizza Store be? And where? NKD have managed to establish a powerful Pizza brand and business in Dubai, Bahrain, the UK and Ireland, with robust financial backing, a well-honed franchisee model and good locations researched for franchisees. NKD Franchisees are promised lots of expert guidance to help establish their Pizza business. From site selection and even construction through to training. Support is also promised for the time when franchisees are already running their stores long after the doors have opened. This includes on-going marketing, top-notch technology, and online ordering. Will This Business Idea Become The Best Pizza Franchise in 2019?